Honey Sesame Chicken is super easy – and really tasty. I mean it IS good and IS a huge hit at the house! So much so that Pat, my 90-year-old Step Mom must have asked me 30 times if I had the recipe all written down (so many are just in my head!) so I could make it again. And make it again, I do. Honey Sesame Chicken in the Instant Pot is one of those recipes that are so good, you’d hardly believe it’s so easy with so few ingredients. And while it might not be a super gourmet authentic Asian recipe (there is the ketchup) it’s going to rival just about anything you can get a most of the “Chinese” restaurants. It has that wonderful sweet/sweet sour vibe without any real heat, so just about everyone is going to love it. I did give you a range of red pepper flakes to add to the recipe so if your tastes run to a little more heat, go for it! And if you know me, you know that I do try to nudge a lot of my recipes toward the healthier side if I can do so without compromising the flavor. My Honey Sesame Chicken in the Instant Pot isn’t sticky sweet, but if you do love that sweetness, feel free to up the amount of honey. Since this is one of those recipes that doesn’t have much going on in the way of veggies, I always make a point to serve it with a side – and for some reason, Honey Sesame Chicken in the Instant Pot just shines with a green veggie like green beans or broccoli. If ya want to get really fancy, try my Take Out Style Green Beans. They’re crazy good! But serve with any kind of veggie you’d like, maybe a mix of stir-fried veggies. And of course, serve with rice to mingle with all that wonderful sauce. Whatever you serve your Honey Sesame Chicken in the Instant Pot with, just make sure to serve it. It might just save your life, too! Honey Sesame Chicken is one of those recipes that practically screams out to be “Pressure Cooked.” I’ve made this multiple times by tossing frozen chicken breast in the Instant Pot and it comes out beautifully. I’ve used thawed Chicken Breast, too, and if anything, the texture of the frozen breasts was even a little better than the fresh. This really is a great, simple recipe with minimal prep and hardly any chopping, which makes it super fast to get in the instant pot. And it doesn’t take long to cook, so start your rice at the same time you start your recipe. Once your Honey Sesame Chicken in the Instant Pot is done, and it’s a very short cook time, open up the pot, remove the chicken and cut it into bite-sized pieces. Don’t worry that some of the chicken might be a bit darker, some a bit lighter, once it’s all coated in the sauce, you’ll never know. And while you’re doing that, set that Instant Pot to saute and bring to a boil. Add in your cornstarch slurry to thicken up the sauce and when it’s just how you like it, add the chicken back in and coat it with the lusciousness! Garnish with sesame seeds and green onions, serve with a veggie, beans or broccoli or maybe a stir-fried veggie mix if you want and you’re looking good! Sit back and wait for those compliments. Always shop for sales priced chicken, portion and freeze in packages to suit your family. There’s no sense in paying $4.69 a pound when it can be had for 99 cents a pound. (Or whatever the lows and highs are in your area!) Generally, chicken will drop to a low about once a quarter, so watch and know what those highs and lows are, be aware of how much chicken your family eats and stock up. If you don’t have a deep freeze, get yourself one. You’ll recoup that outlay of cash in no time. Stock up on Asian ingredients during January when they are often on sale for the Lunar New Year, but might not be advertised. Keep sesame seeds in the freezer; it’s so nice to buy a jar of toasted sesame seeds and not have to worry about toasting your own for a recipe. Look for condiments like ketchup during the summer. You likely won’t find lower condiment prices any other time of the year except for during the Superbowl. Place chicken in the bottom of the Instant Pot. Toss onion over the top. In a small bowl, whisk together the soy sauce, honey, ketchup, garlic, oil, sesame oil, and red pepper flakes. Pour over chicken and turn to coat. Cook on high pressure for 20 minutes. When finished, quick release and remove chicken and leave the sauce in the pot. Cut chicken into bite-sized pieces. Set the instant pot to saute on the high setting. Bring to a boil, then whisk in the cornstarch/water mixture. Cook for three or four minutes, whisking now and then until sauce is at desired thickness. Turn off, add the chicken back in and coat with the sauce. Serve over rice. Garnish with green onion and sesame seeds. There’s enough sauce so that I’ve made this with variable amounts of chicken and it always turns out well. This recipe uses less honey than most. Taste after adding the cornstarch and feel free to add more. To cook from frozen chicken breasts, just add the chicken in the bottom, top with the onion and add five minutes. The total time at the top includes prep & the heat up of the Instant Pot as well as the quick release for the smaller amount of fresh chicken. The cooking time is longer than for most chicken recipes; this is because there is less liquid in this recipe so it needs a bit longer. I’ll be posting Honey Sesame Chicken in the Instant Pot to Angie’s Fiesta Friday #184, hosted this week by Petra @ Food Eat Love and Jhuls @ The Not So Creative Cook. 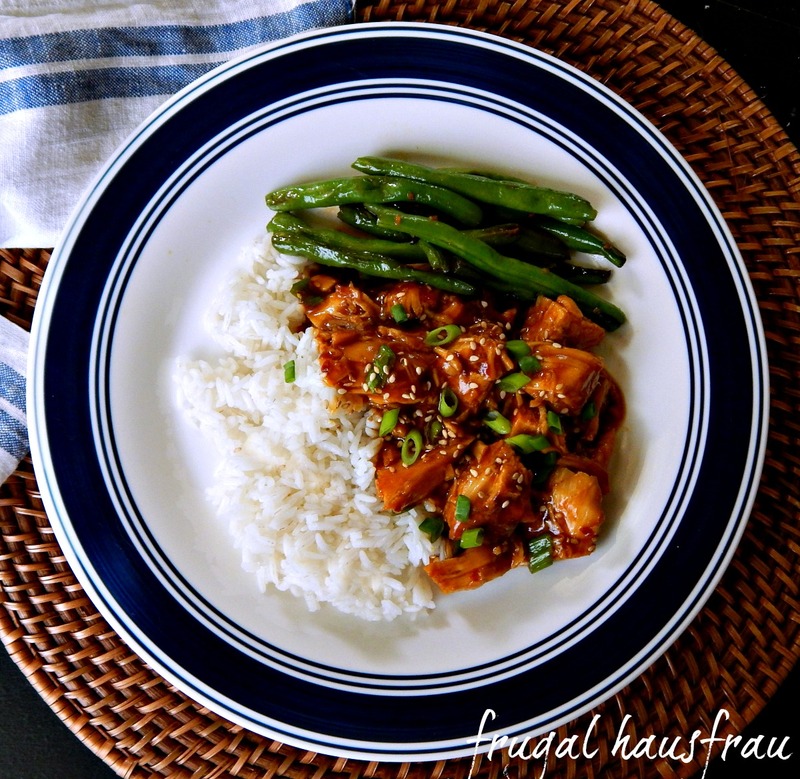 This entry was posted in Click here for Bargain Meals, Click here for Fabulous Food Posts and tagged Asian, Chicken, Chicken Breast, Chicken Thighs, Green Onion, Honey, Instant Pot, Sesame Chicken, Sesame Seeds. Bookmark the permalink. lol, Angie!! 🙂 And thanks!! Hi Petra, and thanks! And thanks for hosting us at FF! I’ve read so many good reviews about instant pot. I may need to get one! 😀 This looks absolutely amazing, Mollie. Thanks for bringing at Fiesta Friday #184! Thanks, Jhuls. A fun recipe – and a quick way to get dinner on the tables. I’m glad to report dinner was on time and there were no actual attacks from the octogenarians, lol! I am going to have to pull out my pot from the storage room behind the garage, this looks like a very useful recipe. I’d love to dig into that. Delicious and fast? Perfect! Hugs.